Homestyle Pork Pot Pie goes together quickly with the use of store-bought pie dough and leftover pork. It’s comfort food that’s as easy as one, two, three. Since my husband and I became “empty nesters” recently, I’m finding myself a bit confused when it comes to cooking for only two people. Even though this pork pot pie feeds more than two people, it utilizes leftover pork which is another way to get more bang for your buck. And who doesn’t want that? 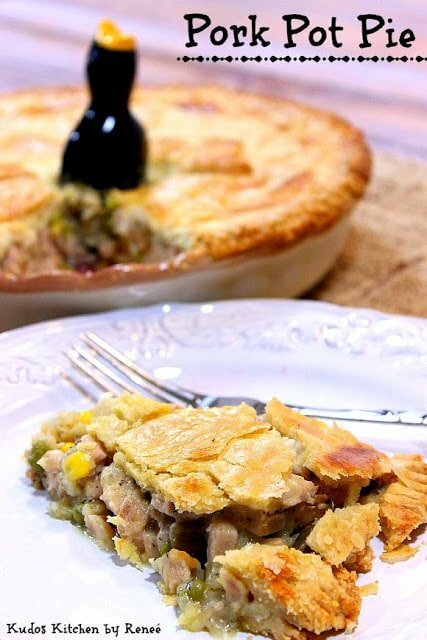 **Please Note – The printable recipe card with detailed instructions, complete ingredient measurements, and nutritional information for making Homestyle Pork Pot Pie is available near the end of this post. How is pork pot pie different from chicken pot pie? Can I substitute cooked chicken meat for the pork in this recipe? Yes, and then you can call it chicken pot pie! What if I don’t have a pie bird? Make a few slits in the top of the pie crust (using a paring knife) to allow the steam to escape, and so the pie doesn’t burst in the oven. Since this Pork Pot Pie takes advantage of leftover pork (from the pork roast I made that could easily feed eight to ten people), it also did double duty in this pie that can also feed eight people. In a large stockpot over medium heat, melt the butter. Stir in the flour and cook for 2-3 minutes. Switch to a whisk and add the chicken stock, salt, pepper, and garlic. Whisk continually until the mixture heats and thickens (approximately 5-7 minutes). Using a wooden spoon, stir in the thyme, mustard, pork, and frozen vegetables. Cook, stirring occasionally to heat through. On a lightly floured surface, carefully roll out one of the pie crusts. Transfer the pie crust to a prepared pie pan that has been sprayed with non-stick spray. *Note – To help with the transfer of the dough, roll the dough loosely onto the rolling pin and unroll it carefully over the pie pan. Press the dough into the pie pan and allow the excess to fold over the sides of the pan. Set aside. Carefully pour the pork filling into the prepared pie crust. On a lightly floured surface, roll the second pie crust out like the first one. Transfer the dough over the pork filling (on the rolling pin) and carefully unroll to cover. Use a paring knife to trim the excess dough away (saving some for the leaf garnish), and use a fork to press and seal the bottom and top crusts together. Use a paring knife to cut some steam holes into the top crust (and insert a pie bird if you have one). Use some of the trimmed dough to cut out leaf shapes and use a dab little water to adhere the leaves to the top of the pie. Whisk together the egg and water and brush over top of the crust. Place the pie on a baking sheet and bake in a preheated oven for 40-45 minutes or until the crust is golden brown and the filling is heated through. Allow the pork pot pie to cool for at least 20 minutes before slicing and serving. Can pork pot pie be made in advance and frozen? Yes! Make the pie up until it’s time to bake (without the pie bird). Then, wrap it well and freeze for up to two months. How long will it keep in the refrigerator after it has been baked? 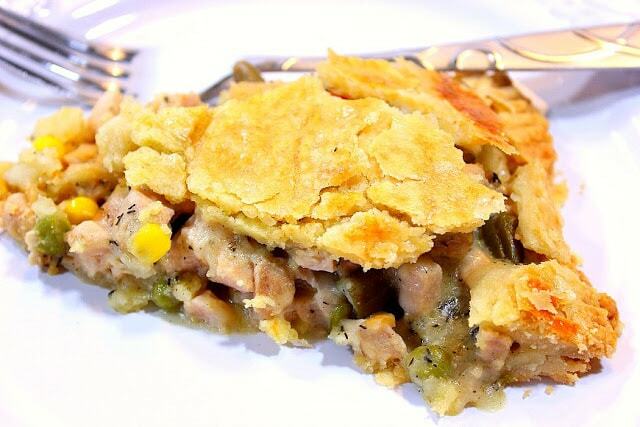 Store the cooked pork pot pie, covered, in the refrigerator for up to 5 days. 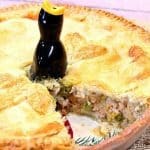 Can Pork Pot Pie be baked from frozen? Yes, but please allow double the oven time, and plan accordingly. Believe it or not, this is the very first time I’ve ever made my own pot pie. This is also the very first time I ever got to use the pie bird that I purchased from Sur LaTable many moons ago. Better late than never, right? Tweet! HaHa! I also just noticed the tie-in about my husband and I being “empty-nesters” and the irony of me using a pie bird. Life is funny sometimes, don’t you think? Below is the printable recipe card for today’s Homestyle Pork Pot Pie. If you’ve enjoyed this recipe and look forward to making it (or have already made it), I’d appreciate if you’d take a moment to give it some feedback by way of stars near the comment section at the end of this post. Thank you so much! Homestyle Pork Pot Pie goes together quickly with the use of store-bought pie dough and leftover pork. Comfort food for all! On a lightly floured surface, carefully roll out one of the pie crusts. Transfer the pie crust to a prepared pie pan that has been sprayed with non-stick spray. **Note - To help with the transfer of the dough, roll the dough loosely onto the rolling pin and unroll it carefully over the pie pan. Press the dough into the pie pan and allow the excess to fold over the sides of the pan. Set aside. In a large stockpot over medium heat, melt the butter. Stir in the flour and cook for 2-3 minutes. Switch to a whisk and add the chicken stock, salt, pepper, and garlic. Whisk continually until the mixture heats and thickens (approximately 5-7 minutes). Using a wooden spoon, stir in the thyme, mustard, pork, and frozen vegetables. Cook, stirring occasionally to heat through. Carefully pour the pork filling into the prepared pie crust. On a lightly floured surface, roll the second pie crust out like the first one. Transfer the dough over the pork filling (on the rolling pin) and carefully unroll to cover. Use a paring knife to cut some steam holes into the top crust, and insert a pie bird (optional). Use some of the trimmed dough to cut out leaf shapes and use a little water to adhere the leaves to the top of the pie (optional). In a small bowl, mix the egg and 1 tablespoon water. Brush the egg wash over the top crust. Cool for at least 20 minutes and serve. I sincerely hope you’ve enjoyed today’s recipe for Homestyle Pork Pot Pie as much as I’ve enjoyed bringing it to you! This hand-painted stein doesn’t really have anything to do with this pork pot pie. However, as I was scrolling through my photos trying to find something that did coordinate, this one popped out at me. I just think it’s funny, and hopefully, you do too. It was a special order requested by a customer. Such a delicious way to use up leftovers! And that pie bird is so cute!! I love easy comfort food, perfect for busy weeknights! I've never made pot pie with pork before! This is a great idea! Awesome comfort food. What a great use of leftovers! I've only ever cooked for two. I just freeze everything (though I imagine this wouldn't freeze well!) This really looks SO good. Love the pie bird, too! Thanks for your comment, Erin. However, I do think this would freeze well (although I've not tried it). The key would be to freeze it before baking then baking it from frozen. I grew up learning to cook for a family of five. Cooking for two these days is sometimes a challenge! We seem to have lots of leftovers 🙂 Love your pot pie. I've made hundreds, but am sure I've never made one with pork. Sounds really delicious. I love a pot pie in any form, but pork is one I've not tried. I'd happily take one of those extra servings off your hands. I have the same pie bird (and it'll be in a post this Friday)! Cooking for just two definitely can be difficult…. but I would not mind having leftovers of that wonderful pie. Enjoy! I have never had kids and I still have trouble cooking for two…haha. I always make food with plenty of leftovers because leftovers are my favorite breakfast. 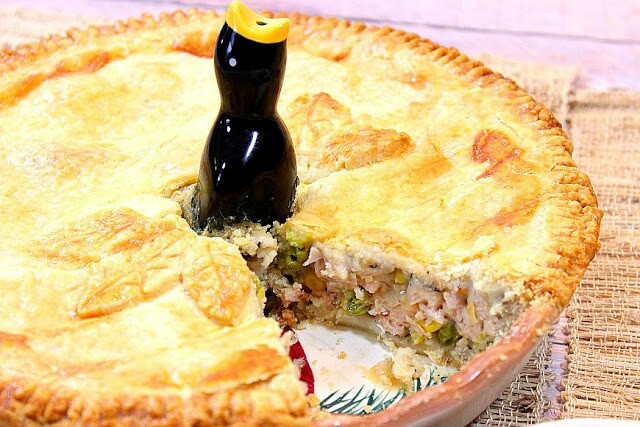 This pot pie sounds delicious and I love that you used pork! Oh man, since my son moved out a few years ago I just can't adjust. Then my daughter was away for 4 months and I've never had so many leftovers in my life. Definitely takes some getting used to. I have a tendency to cook like I'm feeding an army. I love pot pies. 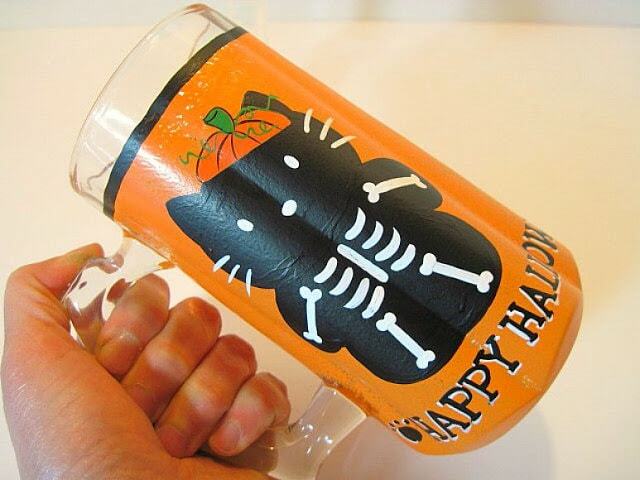 My gramma used to make one like this that I loved so very much. Digging the bird. I keep eyeing them when I'm shopping. I need to pick one up. 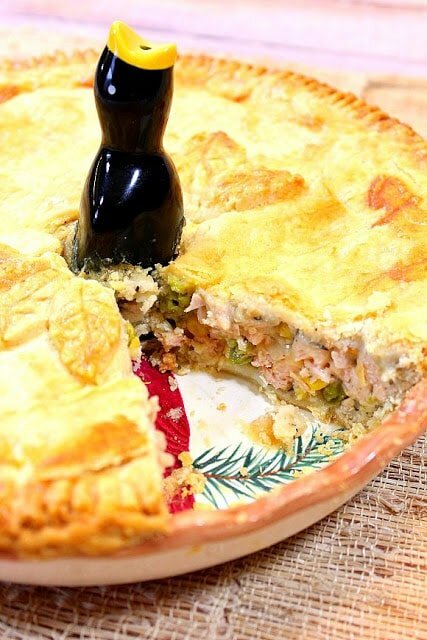 We love chicken pot pie so I bet we'd love this Pork Pot Pie too! Love the little black bird in the pie! I truly love a pot pie of any kind! Can’t wait to try! Thanks for sharing! My pleasure. Thank you, Jennifer! Your pie bird is so cute! And this recipe looks so delicious! I cannot wait to try it! Thank you, Krissy! I know you’ll enjoy this recipe! Do you have any idea how much the baking time should be adjusted to make this into individual pot pies rather than one large one. A different way to adjust to cooking for two. I am still trying to adjust to cooking for two after cooking for a family of seven. Not having done it, I’m not 100% sure. All I can suggest is that you keep an eye on it in the oven and once the crust is golden, and the filling is bubbly, they’re ready. I would think the cooking time would be cut down by at least 15 minutes. This was a hit! The whole family loved it!! Cooking times were spot on. Thank you for the easy recipe! I can not wait to try! I love pork and pot pie, but have never combined them. My will-eat-it-but-doesn’t-love-pork son said he’d happily eat this 2 nights in a row. My super critical son commented that it was nicely seasoned. I didn’t have any frozen veg so added an onion in with the butter. I can’t use Dijon mustard as one son is allergic to it so used seeded mustard with a bit of mustard powder. Super yummy! The amount of pork I had left over made 1 large and 4 single serve pies. I tend to freeze my pies once they’re cooked so when needed I’ll just reheat them. I LOVE this comment, Gwen! I’m so happy this was a family pleaser and I love how you adapted the recipe to fit what you had on hand, and what your family prefers. Kudos to you for making this recipe your own! I wish I could taste your pies! Great that you had enough leftover pork to make minis and now have them on hand in the freezer! WIN!! Have a great day and thanks for taking the time to comment!